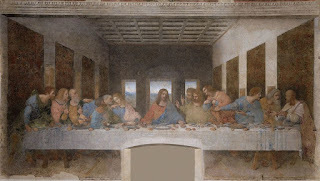 U Can't Anvil The Truth: The Last Supper...Was It Painted By Leonardo Da Vinci Or Someone Else???? The Last Supper...Was It Painted By Leonardo Da Vinci Or Someone Else???? The coordinates is a perfect match to the word HOODWINKED so I decided to examine the painting more closely for numerical codes and this is what I found. There’s quite a few codes that suggest to me that Leonardo Da Vinci isn’t the real painter as you can see with the HOAX, FAKERY and related codes.